Join Lane Side Reviews as they redefine the Richter scale and take it all the way to 055 with the new Brunswick Bowling #Magnitude055. First off, this ball looks absolutely awesome going down the lanes! 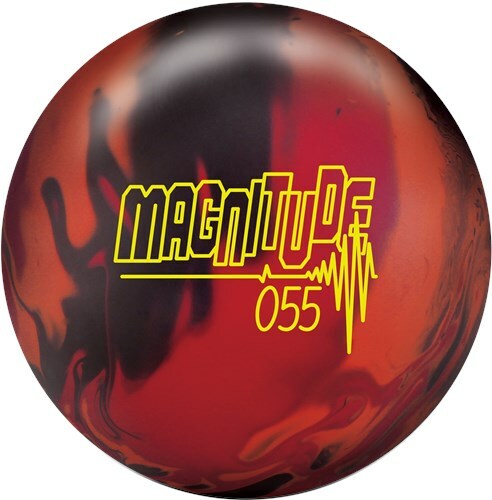 If you liked the Magnitude 035 you’ll be in love with this ball. I drilled my Magnitude 055; 50 x 4.25 x 60. I chose to do this because I wanted the pin below my fingers and duplicated the layout that I used on the Magnitude 035. The biggest thing I noticed is I play the lanes from anywhere to 4-8 boards different then the Magnitude 035. I’m so impressed with the recovery of this ball, and its ability to make its strong predictable motion to the pin deck, and then destroying the rack with unbelievable hitting power. I’m a bowler who loves predictable ball motions, and the Magnitude 055 gives me a strong predictable ball motion that allows for me to make quick adjustments staying ahead of transitions. I strongly suggest getting one of these in your bag immediately.Feel free to contact me by email with any questions; troy_300_1999@yahoo.com. The Magnitude 055 is a stronger stouter cousin to the Magnitude 035. This Magnitude tends to work better on fresher patterns and like its predecessor is very good at evening out wet dry conditions. This ball really shines for me as our slick house shot starts to breakdown. I am able to get in the puddle in the middle of the lane and get the Magnitude 055 to recover at the breakpoint. It never misses the hook spot down the lane and retains energy very well for a ball that is very dull. This ball also uses Dynamicore and seems to carry an extra few corners per game. You get the pin carry of the Quantum balls with the extra performance of a faster revving core. The 055 is a great all around stronger benchmark type ball. If your looking for a stronger symmetrical ball the Magnitude 055 will more than get the job done. Likes: I drilled my Magnitude 055 with the pin above the ring finger and cg kicked about 1/2 inch right with no x hole. Kept the ball at OOB surface for every pattern. This ball really shined on the 39 foot flat pattern and the long pattern. With this layout the ball revs up in the mid lane and walks to the pocket. This ball for me is very smooth, but compared to the 035 solid it starts up a little later down lane, but more overall hook. With it being smooth on the sport patterns I am able to keep my angles in front of me. With all three of the Magnitude’s you will be able to cover almost all patterns between sport and THS. Dislikes: Will only be able to use this for a game or so on the THS patterns I see here because of the coverstock and strength of the ball. The Magnitude 055 is a great compliment to the Magnitude 035. Being a high rev player, I have mostly stayed away from solid surfaces, but this ball fits perfectly in between my bag on the fresh before going to the 035 if necessary. On the pattern that was used, THS, the Magnitude 055 pushed through the oil in the middle, but did not overreact when hitting the dry on the outside. It gave forgiveness on shots pulled inside by holding its line through the oil, yet still having enough in the back end to recover. Both inside pulled shots and shots pushed through the oil to bump the dry, the ball stayed low on the deck with exceptional carry of all 10 pins. Overall, this ball could be used in many conditions, medium to heavy oil, and will give the arcing back end that is well controlled with continuous drive. I recommend this ball to any level bowler looking for a go to ball. Drilled my Magnitude 055 60x5x45 (pin up) with the hopes of giving me something just a tad stronger down the lane than my tired Freakshow Solid. My first experience was on 45' Route 66 on a newer lane surface with a brand new FLEX machine and the pattern has played extremely slick + flat with less than 20% of the players in our scratch league averaging over 200 for the quarter. The 055 gave me a steady look staying tight up around 11-12 when 210 was a big score and kept my consequences low on shots that were a little errant. As the day went on I was able to open the lane up by easing up on my speed and getting around the ball. My carry remained decent even as I got left of the 4th arrow and my pocket % remained surprisingly high despite the pattern not being forgiving. My experiences on the house shots have been very hit and miss. The same house puts out a heavy 42' top hat that has been infuriating for most higher rev players. The cliff is so extreme, that it is typically difficult to carry, yet the soft speed, low rev players have the world. The Magnitude 055 is the one ball in my bag that blends the cliff out enough to prevent me from leaving odd designs. Balls that get into the friction early roll up and stop hooking enough to still hold line to the pocket, yet when I pull the ball, the Mag 055 creates enough friction to roll through the pins leading to surprisingly good carry in the puddle. My experience swinging the lane with this ball has not been very good. It is too rolly and even of a ball to really open up the back end of the lane. My best experiences have been keeping this ball tight just inside the oil line when the oil is fresh. Compared to other balls in the Brunswick lineup the Mag 055 splits the difference between the very early Fanatic SS and one of my favorites, the Melee Hook. I experience a comparable amount of length out of my Kingpin, but the Mag 055 is much smoother at the breakpoint. This is a control ball designed to keep you in the pocket when playing tight in oil. Use it for what it was designed for and it will be a go to ball on flatter, slicker conditions. Recently got a Mag 055. I am a Full Roller with low ball speed, low revs and a 90 degree axis rotation. I have zero tilt so it is hard for me to get a ball up the lane since it wants to roll so early. I got the Mag for heavy oil so I drilled it strong with pin at 3 3/8". I have used it in two houses so far. First time out was on the Big Ben pattern on Brunswick Pro Anvilane. Normally I struggle to get hook on these lanes and have to play from the outside. Not with the Mag, it was so strong I actually had to keep my ball path left of second arrow at all times. Basically up 12 out to 10 and back. If I missed right the Mag would not recover as it rolled out instantly and stayed right. If I missed left it would not hold, it would crossover. I had zero margin for error with the Mag at stock finish and did not score well with it. I then tried it at another house that has less oil and a more blocked condition. Same issues, won't come back on misses right into the dry and will crossover immediately on misses left. Zero margin for error. This ball is just that strong at the stock grit. With the strong high flare layout I put on it and my slow ball speed and zero tilt, control is difficult with it. But when I get a good pocket hit, the pins really explode and are loud! Maybe it is the Dynamicore doing that. I think what is needed for me is to take the surface up to 4000 to get a more controllable reaction out of the Mag. I will try this and update once I have experimented. As it is, the Mag is too strong for me with a very small margin for error making it very difficult to stay in the pocket. Follow up to my Mag review. Rather than alter the stock coverstock on my Mag, I decided to make one small layout alteration. When I first drilled up the Mag I put the strongest Full Roller layout on it with pin at 3 3/8”. But I also did one other flare increasing trick for Full Rollers, drill the fingers super deep, over 4”. I was getting up to 5” of flare. So I plugged and drilled the fingers to shallow depth, just deep enough not to hit them with my fingers. Now I am getting only 3” of flare. Big difference in ball reaction! The Mag is a totally different ball. It gets up the lane clean now and rolls up smooth providing control and power. It still rolls heavy, but now it is controlled power. Where before it was too strong and shots leaked right would not come back and shots missed inside would not hold, now I have recovery from the right and hold on the inside. I am very pleased with the heavy rolling ball and how even light pocket hits carry like crazy! I am so pleased I ordered one more Mag, now that it has been discontinued, and will be putting an Axis drill on it for floating from the outside. Brunswick discontinued the Magnitude 055! So I went online and bought one more at a discount for only $99. On my first Mag as my review above mentioned, I put a Leverage Layout with pin at 3 3/8". But I wanted to do something totally different with this second one. I have had great success on light volume house shots using my True Motion with Axis layout from the outside, I wanted a similar look from the outside, but for heavier house shots or sport shots that the TM could not grip well on. Enter the Magnitude 055 with Axis Weight Layout. I went to the same lanes I made my previous Mag video at. Brunswick Pro Anvilane with the Big Ben pattern. I got there early in the morning right after oiling and was bowling on the fresh, so there was well defined shape on the fresh pattern. I played the same shot as my previous video, right up 8. While the Leverage Layout produced a smooth arcing move through the lane, the Axis Layout produced a real Skid/Flip reaction! If you watch the video below you will see the Mag with Axis Weight get very, very far up the lane and then just stop and flip like it hit a rubber mat in the backend! But, despite this flip action, the Axis Layout allowed a lot of control. I was able to get slow and float the ball to the break point and watch it flip. The Axis Layout really conserved a lot of energy that it then released in a very sudden and short roll cycle.